^ Tannahill, Reay (1973). Food in History (Stein and Day. ISBN 0-8128-1437-1). p. 37, 61, 69. ^ Thus offering the three basic foodstuffs, observes Miguelonne Toussaint-Samat, Anthea Bell, tr. 2009. 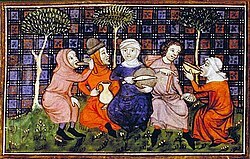 The History of Food, rev, ed. p. 201. ^ 3.0 3.1 Anna Revedin, Biancamaria Aranguren, Roberto Becattini, Laura Longo, Emanuele Marconi, Marta Mariotti Lippi, Natalia Skakun, Andrey Sinitsyn, Elena Spiridonova, Jiří Svoboda. Thirty thousand-year-old evidence of plant food processing. Proceedings of the National Academy of Sciences. 2010-11-02, 107 (44): 18815–18819 [2018-04-02]. doi:10.1073/pnas.1006993107. ^ Pettitt, Paul. The Rise of Modern Humans. (编) Chris Scarre. The Human Past: World Prehistory and the Development of Human Societies. 2005. ^ Scarre, Chris. The World Transformed: From Forages and Farmers to States and Empires. (编) Chris Scarre. The Human Past: World Prehistory and the Development of Human Societies. 2005. ^ Diamond, Jared. Guns, Germs and Steel. 1997. ^ McGee, Harold. On Food and Cooking. 2004: 517. ^ D. Samuel (2000). "Brewing and baking". Ancient Egyptian materials and technology. Eds: P.T. Nicholson & I. Shaw. (Cambridge: Cambridge University Press ISBN 0-521-45257-0) p. 558. ^ Toussaint-Samat 2009, p.204 gives a date of 168 for "a considerable influx of craftsmen bakers (pistores) of Greek origin into Rome". ^ Chrysippus of Tyana gives a list of thirty kinds, without commentary (Toussaint-Samat 2009, p. 202). ^ Changes in diet are reflected in the modern significance of opson as fish (Toussaint-Samat 2009, p. 202); in Italy the contorni are now the accompaniment to meat rather than bread. ^ It occupies a section in Siegfried Giedion, (1948) 1969.. Mechanization Takes Command (New York Oxford University Press). ^ Christianne L.H. Hupkens, Ronald A. Knibbe and Maris J. Drop, for example analyzed social class variation in the intake of fat and fibre, including white bread consumption, in Maastricht, Liège and Aachen, "Social Class Differences in Women's Fat and Fibre Consumption: A Cross-National Study" 1995; the literature on class perceptions and diet is enormous. ^ The Chorleywood Bread Process, Training course, Campden and Chorleywood Food Research Association (CCFRA). （原始内容存档于2007-09-28）. ^ Hui Y and Cork H (2006). Bakery products: science and technology. Blackwell Publishing.